Why did you choose to study Law at City? I’ve always wanted to study law. I did my foundation degree at another university in London so I already had a flavour for the city and wanted to stay. 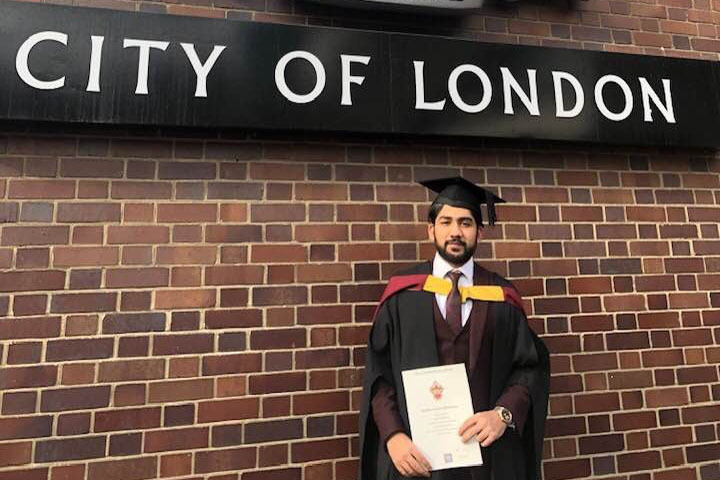 The idea of being an advocate of the ‘rule of law’ motivated me and the rich and powerful history of the British law made City, University of London an attractive place to study the law. I’m from Pakistan, where a law degree from London is held in high regard. My cousin went to Cass Business School and I knew some other people who had studied on City’s law course before me. They’d all had great career opportunities after their degrees in both London and Pakistan, which really swung it for me. In Pakistan, they also respect universities that have been around a while. City is an old university and it was important to me that my future institution had a rich history. The buildings on campus are beautiful, too. How was your experience on the course? I really liked the way the LLB (Hons) course was taught. Each year, I could feel myself progressing. They stepped up the level of teaching year by year, which made it an easier transition to the next stage. If you attend the lectures, study hard and do the required reading, you will do well in the exams. City does such a good job of preparing you for what you would face in the assessments. I’d heard good things about the level of support you receive on your course. In second year, I had to undergo multiple surgeries due to an accident and wasn’t able to attend classes. I was worried I would be disciplined but it was quite the opposite. My personal tutor and the administrative team were supportive and ensured I had enough time to fully recover and get back on my feet. I’m really grateful for that. My personal tutors and programme coordinators were also there for me when I needed advice on future qualifications and my career. They offered helpful guidance and resources which enabled me to make important decisions about my future. What opportunities were presented to you as part of your studies? As part of my course, I had the opportunity to go and study in France for a semester. It really added depth to my degree. As well as seeing law from a different angle, I got exposure to a new culture and was able to learn a new language. I even got a French language certificate that I’ve added to my CV. The best thing about it was that it didn’t extend the duration of my degree, it just replaced one of my City semesters. I think it’s crucial to think about your career from the start of your degree. Everything you do relating to your degree is so important and helps build a picture for your future employers. People I know who had been successful after their City law degree had put in time to gain experience, so I volunteered at a legal foundation and a solicitors’ firm during my studies. What tips would you give to students to help them settle at City? When you arrive in a new city, you might be worried that you’ll miss home comforts. For me, I was worried I would miss the food from back home. But London is such a culturally diverse city that I was able find the best Pakistani food right on my doorstep. On the flipside of that, there are some things which aren’t easily accessible to me in Pakistan. But in London, that’s never a problem. The Students’ Union was one of my favourite places to hang out at the University. You can meet people from all over the world with different backgrounds and cultures. As an international student, I didn’t feel like I was abroad in another country, I felt at home which was really comforting. I also joined the City Law Society and the Pakistani Society, where I was able to meet people with similar interests. I even helped run an event which helped international students understand the legislations in the UK. Of course I had worries before I started. Have I made the right choice? Will I fit in? As soon as I got settled, I knew I had made the best decision for me. If I could give advice to students thinking about going to university it would be to pick a university where you can truly see yourself. It’s three or maybe four years of your life, so choose a university where you can be yourself and enjoy your studies. Overall, it can be rightly concluded, that City offers its students a pack of goodies, which bears the fruit as soon as it is unpacked. I didn’t think twice when deciding the provider for my post grad. I have only moved a few blocks to Gray’s Inn Place.